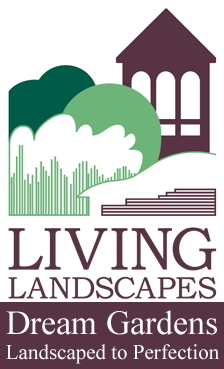 Welcome to Immerse, the garden designed by Cherry Carmen, sponsored by Living Landscapes and supported by Perennial. 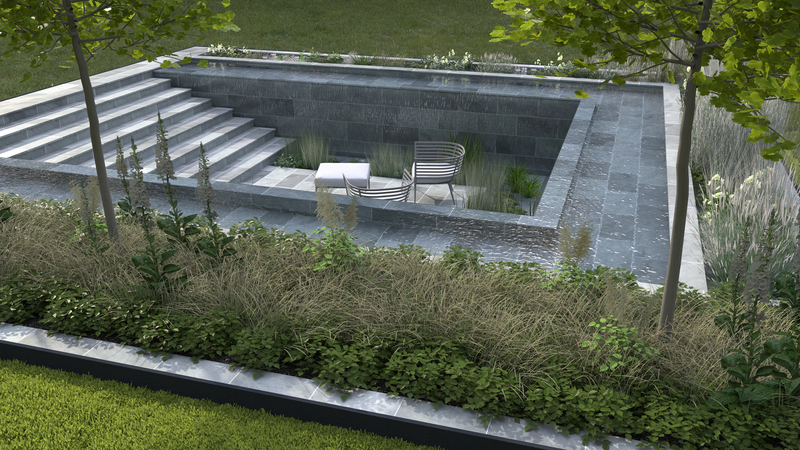 Immerse, the Living Landscapes Garden, designed by Cherry Carmen of Cherry Blossom Landscapes. 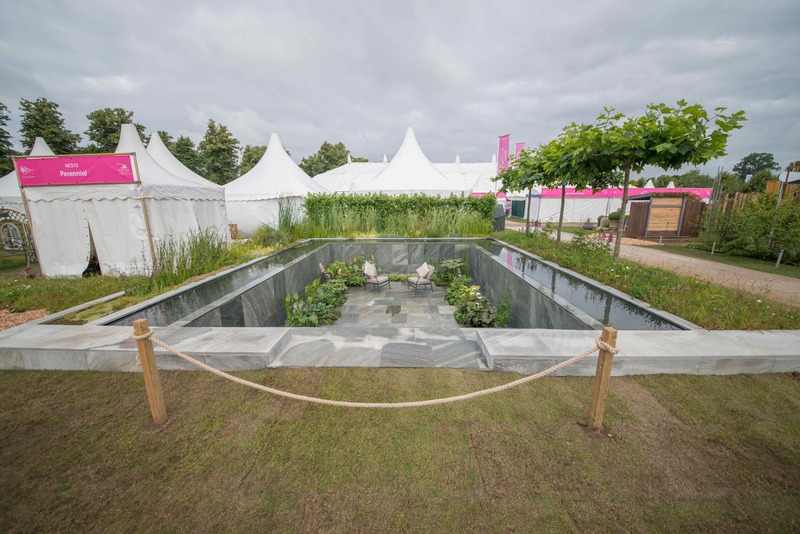 First time show garden designer Cherry Carmen from Horsham, West Sussex realises a career ambition of creating a garden for the RHS Hampton Court Palace Flower Show in July 2016. 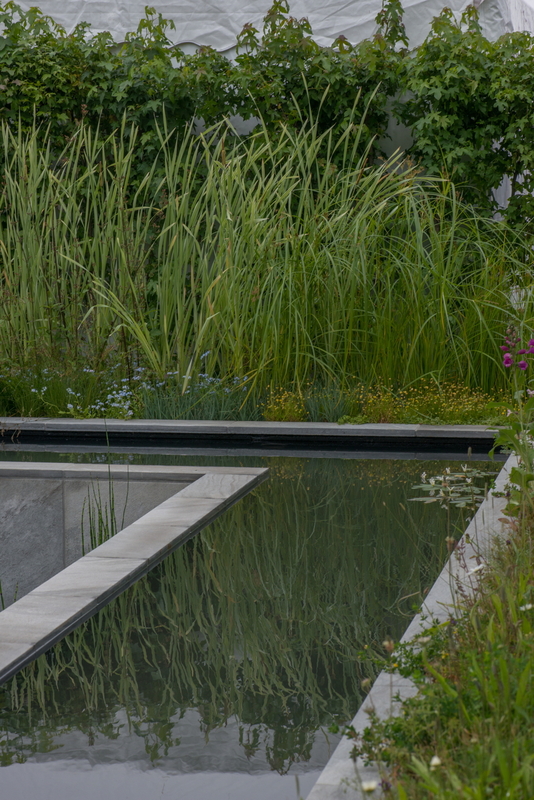 In a collaboration between sponsor and contractor Living Landscapes, designer Cherry Carmen and charity Perennial, Immerse is one of three gardens in the show’s popular Water Garden category, which has been reintroduced this year after an eight year absence. 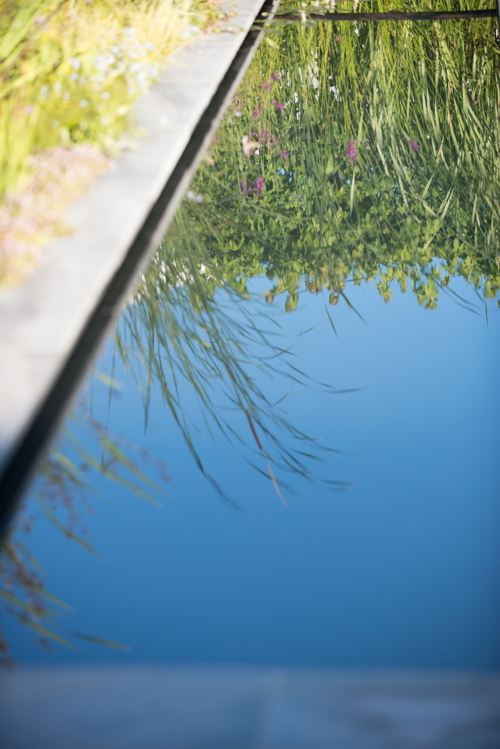 Immerse reflects the work of Perennial, the charity that looks after gardeners and everyone who cares for our green spaces when times get tough. Having just finished a second round of chemotherapy for kidney cancer, Cherry understands from personal experience the value of this type of support. Cherry’s design flows with positive energy, capturing a sense of being protected and nurtured, as well as revitalised and inspired. 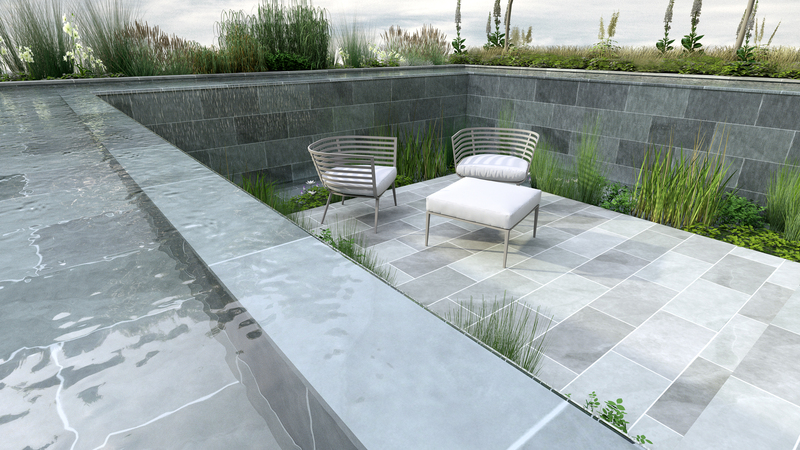 It incorporates an innovative recessed seating area below ground level, with cascading water walls on three sides forming an intimate space for reflection. 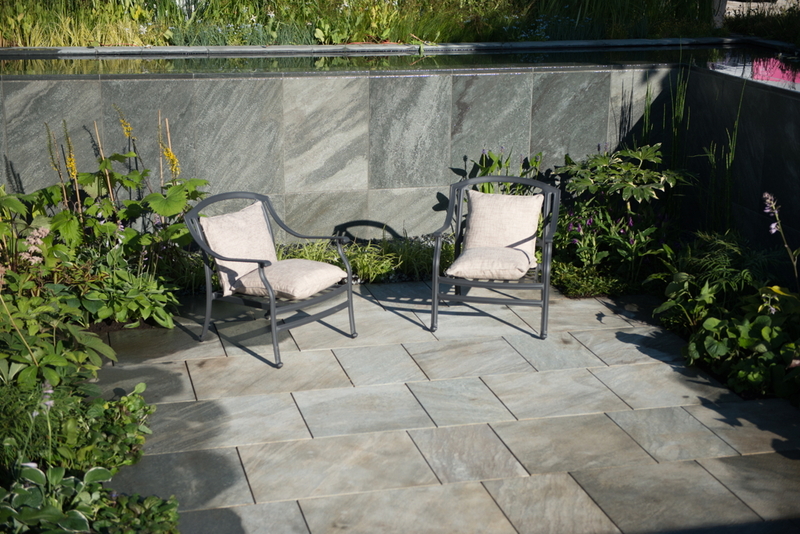 The hard landscaping supplied by CED Stone Ltd gives this water garden its strong, modern lines, while the unstructured, textured planting adds a comforting softness. 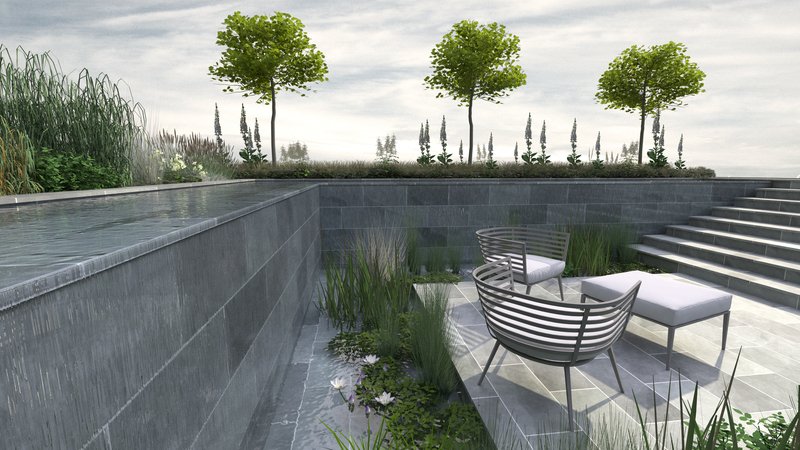 Planting on the upper level is grassy, with lots of movement. Plane trees, trained to form a parasol, are under-planted with woodland shade-loving wildflowers. Moving down the steps, there is an abundance of lush, wide-leafed plants. 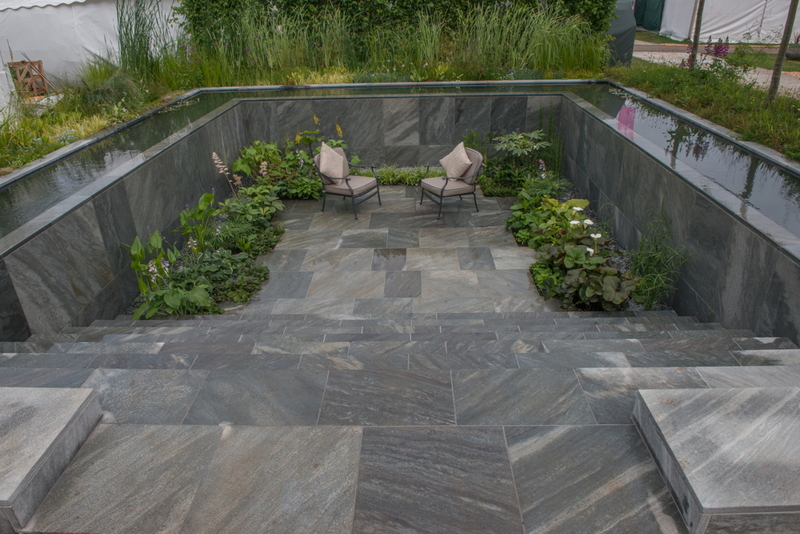 The creation of Immerse has only been made possible thanks to the support and generosity of many partners, suppliers and volunteers including CED Stone Ltd, Samuel North, Griffin Nurseries, Landscape Plus, North Hill Nurseries, Oase, KC Fibreglass, Anglo Aquatics and Verdon Grey. 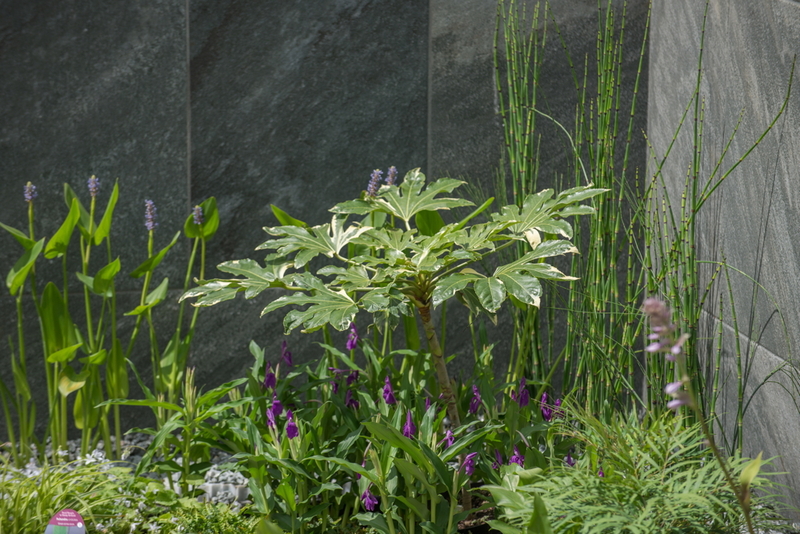 For further information about Perennial and its range of free and confidential services for all horticulturists in times of need, visit our Ways we can help pages here.